We visited Guyana in early August of 2000 on family business. It's a poor place, but we were welcomed with a warm hospitality. We really enjoyed the visit, especially because Vijay's father, "Grandpa Buddy" was our guide. Guyana isn't a typical tourist destination, so this page gives some background for those not already familiar. Guyana's Northern coast borders the Caribbean Sea. The low coast land is near or below sea level. Tropical rains keep it plenty wet. Sugar cane and rice thrive. 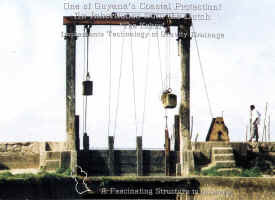 Just like in Holland, the Dutch created a water control system to contain the tidal water using "Kokers," or sluices. Opening a sluice during low tide allows excess water to drain to the ocean from a huge grid of drainage canals. This way, the water level in the rice and sugar fields is carefully controlled. Click on the picture above to see a post card of a sluice. Guyana is one of the only English speaking countries in South America. There are also many other languages spoken, including a version of Creole that emerged during slave times. Beautiful proverbs abound. Click here to see some of the best proverbs. Of course, English is only one of many languages. Click here to see a list of the many languages of Guyana. No matter what language you speak, the Guyana Telephone & Telegraph Company, GTT, will handle your phone calls in and out of the country. GTT is not yet entirely reliable, so language really doesn't matter! Guyana's inland has tropical rain forest. The inland is remote and rugged, with almost no passable roads. For example, Kaietur Falls, a famous eco-tourist destination, can only be reached by bush plane. The 822 foot tall falls weren't even discovered until 1870! Click here to learn more about Guyana's place in the contemporary Amazon basin. Despite the environmental value, tropical hardwoods are harvested with a disturbing zeal. There's also mineral riches like bauxite for aluminum production. Gold is also plentiful. Click here to see information about one gold mining company in Guyana. In August of 1995, a Canadian mining committed a famous, but atrocious environmental disaster by spilling tons of cyanide from the Omai gold processing facility into the pristine Essequibo river. Click here to learn more about the spill. Speaking of cyanide, many "outsiders" think of the infamous "Jone's Town" mass suicide when Guyana is mentioned. Actually, the true capital of Guyana is Georgetown. Georgetown lies near the coast. 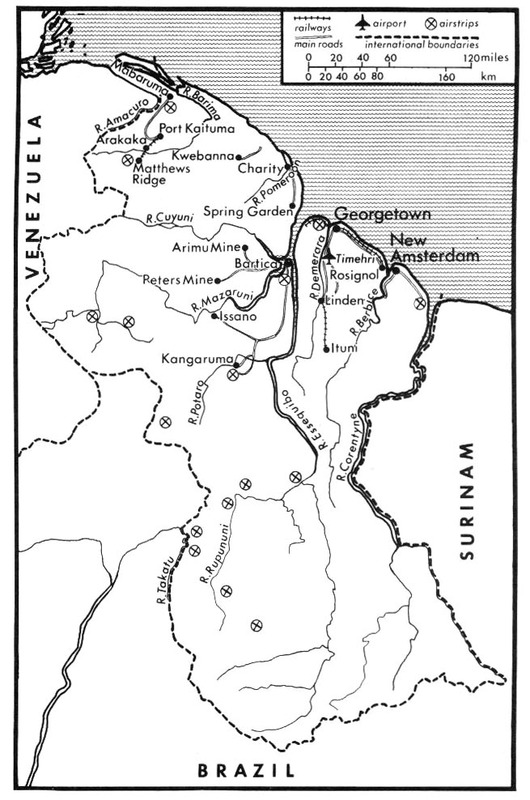 Most of Guyana's other population centers also lie near the cost or near a river. That's one reason Guyana is known as the "Land of Many Waters." Guyana's history is very rich. Guyana's first settlers were the Amerindians, thought to have first arrived around 500AD. Next came the Spanish. The cruelty of the Spanish was well known throughout the Caribbean, so the Amerindians didn't find much favor. 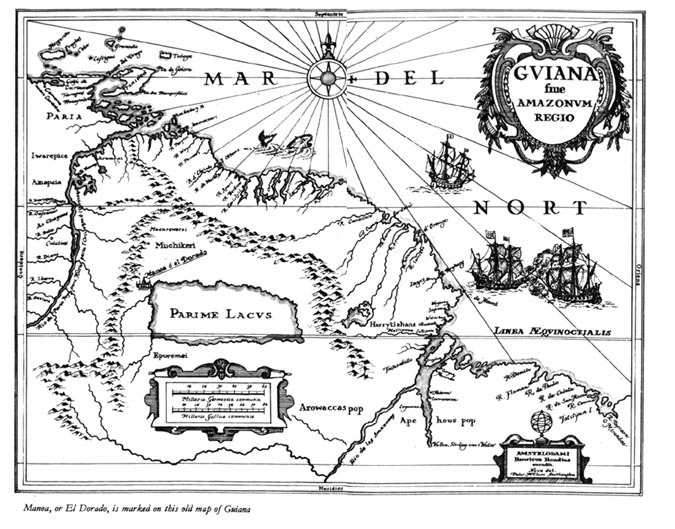 During the 1530's, the Spanish and Germans put Guyana "on the map" while looking for golden lake of El Dorado. El Dorado, the "golden man," comes from an Inca story of a king who threw tons of gold offerings into a lake called "Guatavita." The story was widely popularized in 16th century Europe, and many failed expeditions were launched to salvage the gold. During the 1590's, Sir Walter Raleigh arrived under the England's flag to find El Dorado. In 1617, Sir Walter Raleigh fought the Spaniards with the help of the Amerindians, although he lost his son. Although he never found El Dorado, he taught Europe of Guyana. The Dutch, under the command of Cabeliau, sailed from Holland in 1597 and landed in Guyana in February of 1598. They explored all of Guyana's major rivers with the help of the Amerindians. Instead of lusting for gold, they found riches in tobacco and annatto, a dye plant. The Dutch settled, and began trading commodities. The Portuguese fought with the Dutch during 1623 and 1625. The Dutch prevailed. 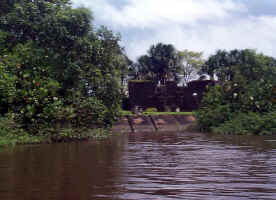 They lived at river settlements near today's Bartica along the Essequibo River. The ruins of the Dutch settlements are still visible today. By 1637, the Dutch started their first sugar cultivation in Guyana. The pictures below show present day ruins of an old Dutch forts along the Essequibo River. In 1621, the "Dutch West Indies Company" was formed. 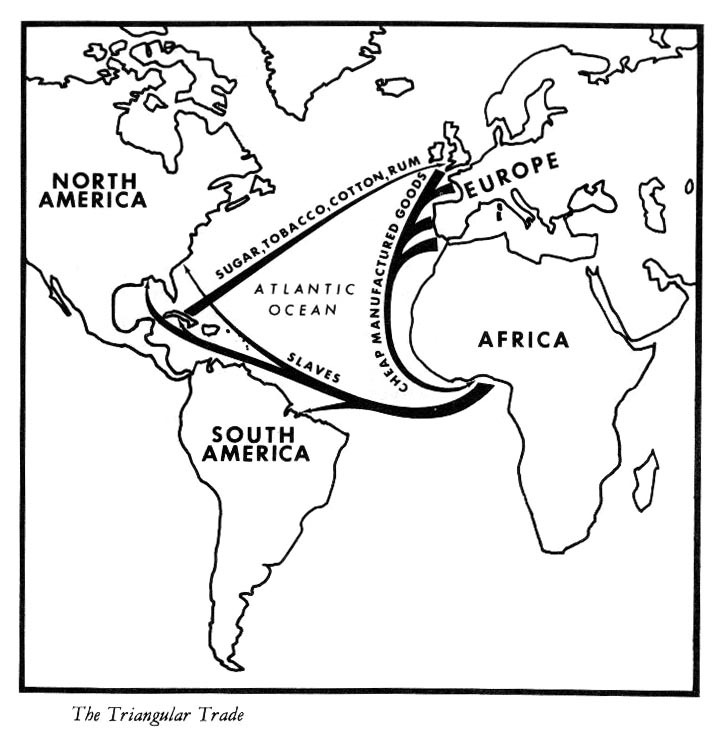 The West Indies Company created a trade monopoly to move goods, including slaves, between continents. By 1642, the Dutch had defeated the Portuguese and secured their monopoly. 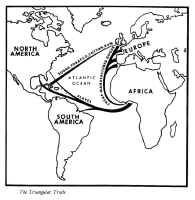 They sailed a triangle of trade, taking raw materials from the new world to Europe, then finished goods South, and finally slaves to the West. By 1674, there were five Dutch sugar plantations near Guyana's city of Berbice. All of the sugar plantations were manned by African slaves. The Dutch fought constantly with other Europeans throughout the West Indies. In 1674, the third Anglo-Dutch war was over, and the Dutch West Indies Company was nearly ruined. 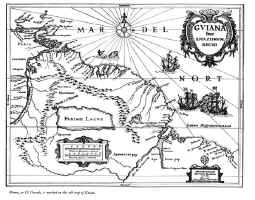 The English and Dutch eventually allied, but the French Buccaneers attached settlements in Guyana from 1689 to 1697. During the 1700's, the French and English fought constantly throughout the new world. By 1743, the English owned 7 sugar plantations along the Essequibo River and others along the Demerara River. Fighting continued throughout this time. In 1783, the Treaty of Versailles was signed giving the French many of the Caribbean Islands, and much of Guyana to the Dutch. After several more treaties and invasions, the English finally prevailed over the Dutch in 1803. Think of all the blood spilled in the name of sugar! Slaves were the key to sugar plantation economics. The African slaves weren't always cooperative. On the 23rd of February 1763, a famous rebellion occurred in Berbice. The slave "Coffy" lead a successful rebellion that is commemorated to this day. Unfortunately, the slaves didn't find unity among the various African tribes and were unable hold their ground. Eventually, the Dutch restored control. In 1807, English evangelicals persuaded the British Parliament to condemn the slave trade. A glut of sugar, low sugar prices, and the industrial revolution expedited the decision. Legal arguments about slavery were handed down from the Demerara Court of Policy in 1825, but it wasn't until August 1 of 1834 that slavery was officially abolished throughout the British Empire. "Abolition Day" is celebrated on August 1st to this day in Guyana. Planters still needed help to run the plantations after abolition. They began paying salaries, although quite low. The first workers strike was in 1842. Pay was 32 cents per day, with no benefits. Eventually, it became necessary to find new sources of labor for the plantations. Immigrants came from Portugal, China, and India. East Indians first arrived in 1838, although slaves were still being illegally imported from Africa. Indians frequently arrived under terms of "apprenticeship" which was basically an indentured servitude. Net result was that Indians were treated like slaves. To this day, most of Guyana's population either descends from black African, or East Indian heritage. In 1831, the British mapped together several former Dutch holdings and formed the colony of "British Guyana." British Guyana slowly fell under colonial policy neglect. Poverty ruled. The first labor union was formed in 1919. Click here to learn more about contemporary labor issues. After the first world war, unrest was common throughout the poorer British colonies. In the late 1930s, the British Government sent Lord Moyne under a Royal Commission to study the situation in the British West Indies. Moyne identified poverty as the cause of unrest. In the early 1950's, local parliamentarians Dr. Jagan (Indian heritage) and Mr Burnham (African heritage) began popularizing the idea of independence as a route from poverty. On May 26, 1966, Guyana finally found her independence. Burnham became the first President after a controversial election. Burnham held power until his death in 1985. The first election used "proportional representation" by political party. Although Jagan's PPP party won the popular vote in the first election, an ad hoc political collation put Burnham's PNC party into power. The East Indian population feared discrimination under Burnham's largely African government. Many East Indians fled Guyana to England, Canada, New York and Florida. Burnham's government was widely considered as corrupt, so many remaining in Guyana suffered under his rule. After Burnham's death, long overdue infrastructure improvements finally began. In of 1992, Jimmy Carter and other international observers helped with a "free and fair" election. Click here to learn about the Carter Center's election monitoring. Jagan's PPP party finally prevailed in the monitored election. Click here for more information about Guyana's late Cheddie Jagan. The British still play a role in post-colonial Guyana. For example, the British company Tate & Lyle still manage the economics of the state-owned "Sugar Estates." The Europeans are the source of much foreign aid. Unfortunately, even with British help, the country is heavily indebted and the business climate is difficult. Click here for an IMF report on International aid. Although our experience as tourists during August 2000 certainly backs up the somewhat discouraging claims of the US State Department, we found plenty of reason for optimism. The young are well educated and a spirit of hope prevails. We found ourselves as welcome guests, and we enjoyed the warm hospitality of Guyana's people.